New for 2018! 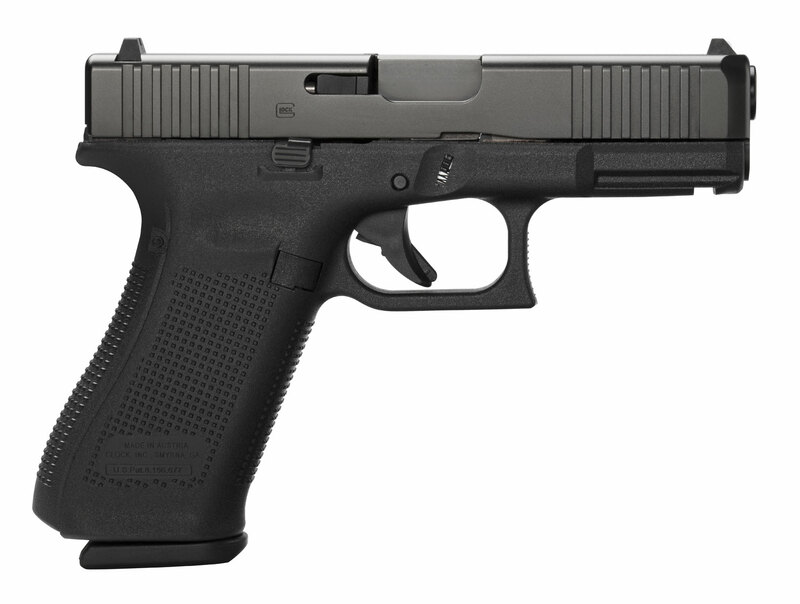 Glock 45 Gen 5. The Compact Crossover pistol G45 in 9x19mm combines a compact slide with a full size frame and has all the benefits of a Gen5 model. 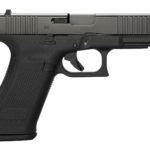 Utilizing the design and engineering GLOCK developed for its military pistols (G19X), combined with Operator and worldwide Law Enforcement specifications. Interchangeable Magazines. 3 17rd Magazines. New for the Summer of 2018! RUGER® PC CARBINE™. A new, no-nonsense take down carbine in 9mm using common magazines that should become a favorite all-use fun gun to shoot! Interchangeable magazine wells for use of common Ruger® and Glock® magazines. Ships with SR-Series Pistol and Security-9® magazine well installed and an additional magazine well accepting Glock® magazines is included*. Ruger American Pistol® magazine well is available at ShopRuger.com. Easy takedown enables quick separation of the barrel/forend assembly from the action for ease of transportation and storage. Takedown is as simple as locking the bolt back and verifying that the rifle is unloaded, pushing a recessed lever, twisting the subassemblies and pulling them apart. Dead blow action features a custom tungsten dead blow weight that shortens bolt travel and reduces felt recoil and muzzle rise. Bolt is machined from heat treated, chrome-moly steel to ensure strength, structural integrity and durability. Reversible magazine release and reversible charging handle to support ambidextrous use or one-handed control manipulation while maintaining a proper firing grip*. Cold hammer-forged, chrome-moly steel barrel with ultra-precise rifling provides exceptional accuracy, longevity and easy cleaning. The heavy contour barrel provides consistent accuracy, while barrel fluting sheds unnecessary weight and allows for quick handling. 1/2″-28 threaded barrel with included thread protector allows for use of standard muzzle accessories. 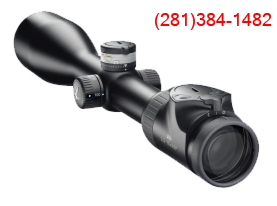 Accurate sighting system with adjustable ghost ring rear aperture sight and non-glare, protected blade front sight. Soft rubber buttpad with spacers allows the rifle to be properly sized for different shooters or varying levels of outerwear or defensive gear (three, 1/2” spacers included). Durable, glass-filled nylon synthetic stock features sling swivel studs for rapid sling attachment and forward mounted accessory rail to allow for a variety of under-barrel accessories such as lights or lasers. The grip features a proprietary texture for enhanced control. Light, crisp trigger pull with minimal overtravel and positive reset utilizing proven 10/22® trigger components. CNC-milled from an aerospace-grade 7075-T6 aluminum billet, the receiver includes an integrated Picatinny rail and is Type III hard-coat anodized for maximum durability. Also includes: one, SR-Series pistol magazine and hex wrenches for rear sight adjustment, buttpad spacer adjustment and charging handle removal. Price: $979 Credit, $959 Cash! $30 Shipping! Attention Navy veterans and fans! 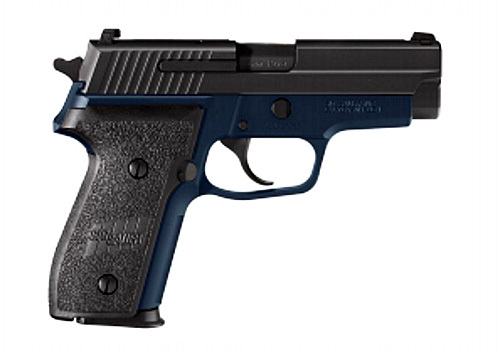 The most popular Pistol of Sig Sauer in a TALO Limited Edition with anodized Navy Blue slide! The Sig Sauer P229 is one of the most popular Sig Sauer pistols on the market. It is carried by thousands of military and law enforcement professionals throughout the country, and its compact size makes it ideal for concealed carry. 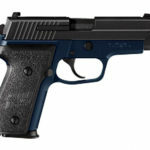 The P229 features a slide profile and an ergonomic grip with updated designs. This TALO Special Edition Navy of the military variant M11-A1 is a unique way to own this wonderful and prove pistol. Please check out its specs!